Defend your ankles from the cold with a little woollen armour! Simply a great accessory that instantly alters and enhances your clothes and footwear for many different looks, Falke Armour Ribbed Virgin Wool Leg Warmers can be worn scrunched down, pulled up a little with ankle boots or pulled up fully over the knee for high boots. 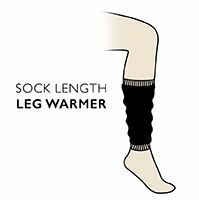 The leg warmers are made wool-rich, with pure virgin wool giving them their soft, fine and silky feel. Their wide ribbed knit uses a patterned moss stitch between the raised ribs to create texture and structure for an attention-grabbing look.